On 20th March this year, TiE Bangalore presented the TiE Earth Hour celebration, a prelude to celebrating Earth Hour (a worldwide eco-initiative held on 28th March between 8.30 PM and 9.30 PM IST). Organised by the TiE (The Indus Entrepreneurs) Bangalore Special Interest Group (SIG) on CleanTech, the programme began with a brief introduction by Ashok Das who has co-established and spearheads CleanTech SIG. Das is also the CEO of SunMoksha Power that designs and implements solar applications and solutions. CleanTech SIG was launched in June 2008 with the aim of establishing an ecosystem for clean technology and to provide its members opportunities for mentoring, networking and discussing trends in technology and business in the clean technology areas. With an online presence, it welcomes participants here. Dr. A Ravindra (former chief secretary to the government of Karnataka), addressed the gathering and shared the initiatives started by the state government even as he drew on experiences from his own organisation – the Centre for Sustainable Development (CSD). He highlighted the need for utilising this period of recession as an opportunity to promote clean technology. It was interesting to hear Dr. Ravindra’s honest critique of the role and limitations of government initiatives. “The Government is good at policy formulation and documentation, but often lags behind in action,” he said. Dr. Ravindra mentioned the Bio-Fuel Board set up by the government of Karnataka but said that this area required substantial research that was not yet available. He also cited the government’s initiative in setting up the Ministry of Non Conventional Energy Resources; with a central government target of at least 10 per cent of the total energy to be produced through non conventional resources. Karnataka, he said, had already exceeded this target by producing 2000 MW through such resources. However, he was quick to point out that the actual challenge lay in making clean technologies cost effective. He assured the gathering that he was willing to refer genuine suggestions and recommendations for adopting clean technology /practices to the government. Dr. Ravindra shared some of the findings from studies conducted by CSD through their lifestyle change pilot project at the identified locations in the central business district areas in Bengaluru city. For instance, on the issue of adopting energy saving practices, CSD – in partnership with BESCOM – had surveyed 1500 establishments in the area and then offered them a list of alternate practices that they could adopt over a three month period, following which another survey was to be conducted. Dr. Ravindra admitted that the response was not unanimous but felt it was a small step in supporting lifestyle change, rather than only speaking about it. This was followed by an inspiring presentation by Jai Bharath, Deputy General Manager Kennametal India (formerly Widia India Limited), a manufacturing firm on Tumkur road. Bharath spoke about the company’s efforts to adopt clean technology in a bid towards optimising costs and conserving energy. He described the various efforts made in the area of water and power. Through initiatives that included rain water harvesting, recharging bore wells, recharging ground water by re-routing water from roads, barrel technology, ponds, check dams and construction of two large tanks (80,000 and 50,000 litre capacity), the company had conserved a large amount of water. Prior to this, they used to buy 10 truck loads of water every day; they now have to buy water only occasionally. The rainwater harvesting process involved an investment of Rs.18 lakh and, with the assistance of Aiyappa Masagi of Water Literacy Foundation, the company was able to harvest eight crore litres of the nine crore litres of water that was received by their 29 acre campus! Similarly, with regard to power usage, through the installation of customised energy meters (from CONZERV) and efficient lighting and other modifications, the organisation brought down its power bill from Rs. 9.4 crores (2004) to Rs. 6 crores (2008). Eco Eye (a corporation wide initiative by Wipro for ecological sustainability), was then showcased by Ramakrishnan Ramaswamy and Sudarshan Ananth. Initiated in 2008, Eco Eye aims to increase ecological sustainability in all operations of the company (Wipro), as also areas of its influence. It attempts to engage with increasing levels of intensity with all the stakeholders and go beyond compliance. The five themes and seven goals identified for eco action were shared. The five themes included being an eco surplus organisation, business investments, beyond Wipro, transparent reporting, risk planning and mitigation. Based on this initiative, Wipro had remodelled internal operations across its campuses to re-look at building design, lighting, cooling system, computing equipment, practices and processes. For instance, with regard to building design, the use of double glazed glass, natural ventilation, skylights, fly-ash and hollow bricks had brought down the energy usage from the industry prescribed standard of 1 k VA per person to 0.68kVA. Similar efforts in the other areas had also proved to be extremely useful for the overall functioning of the corporation, in addition to making a positive change in the area of energy conservation and ecological sustainability.” By sharing this, we are by no means suggesting that this is the only way to be ecologically sustainable,” the presenting team pointed out. They said it was a learning process and they were constantly looking at newer ways to adopt more ecologically sustainable practices and processes. They were also ready to share their experience with others who might be interested. Rajesh Shah, a resident of the Laughing Waters gated community at Whitefield, then took the audience through a virtual tour of his residence, detailing the various design considerations, particularly with regard to plumbing, in order to ensure optimum utilisation of water. Use of solar panels and composting of kitchen and garden waste was integral to the design. He also shared the activities undertaken by Ecolife, a group of young children living in Laughing Waters. Through two short films made by the children, their efforts on waste management and their participation in a protest against road widening at the expense of trees were shared. Manvel Alur then helped the participants understand the term carbon footprint by explaining how one contributes to carbon emissions and what could be done to offset these. An article detailing Kennametal’s efforts to conserve resources is available here. Several exhibits (see list below) found eager and curious participants enquiring about the various ways in which they could get involved. The effort of TiE Bangalore in hosting such an interesting forum that brought together entrepreneurs and practitioners working towards ecological sustainability is noteworthy. Some details need to be kept in mind the next time around, such as refraining from distributing stationery (notepad, pens and feedback forms). This would be in keeping with the spirit and objective of such a programme. Also ensuring that the volunteers are more aware and informed about the issue would be certainly useful. For those interested, there are several other environmental events coming up over the next few months (see www.frogg.in). His films were rooted in reality. His protagonists were blood and sweat unlike in most films. He continues to hark back to reality in his environmental struggles as well. The KSPCB has extended the ‘Consent For Operation’ certificate’s validity for industries and STPs in apartments to five years. There is no need to pay any deposit to the KSPCB if an apartment is unable to complete STP before occupying it. 21st century marvels in Bangalore: Don’t miss visiting them! 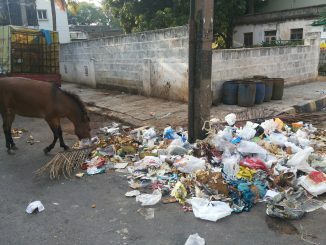 Traffic management systems that cause jams, footpaths meant for exercising, beautiful garbage dumps – many more things can become tourist destinations in Bangalore!